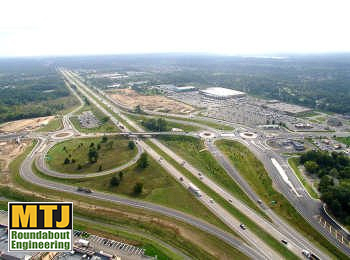 Mark Johnson, P.E., was the roundabout design engineer responsible for the capacity analysis and horizontal design of what is the most complex system of roundabouts in the US at this time. The roundabout corridor handles approximately 8,000 vph and opened in 2006. Signal alternatives were found to have inadequate capacity, resulting in excessive delays and potentially dangerous backups on freeway ramps. The double roundabout configuration at the southbound ramp terminals accommodates the five entries and exits with minimal circulating flow – increasing intersection entry capacity and reducing crash potential. High-capacity roundabout intersections allowed a major interchange capacity improvement, while deferring the high cost of widening the bridge over US 23. This is an excellent example of placing capacity where it is usually needed – at the intersections – while maintaining narrow connecting roads between intersections.